I am always looking for new and interesting way to use the iPad in storytime. I have used it several times to show pictures of something that is in one of the books that we read. For example, when we read a book about a grandfather’s topiary garden, I showed pictures of real, rather impressive topiaries (teaching background knowledge). 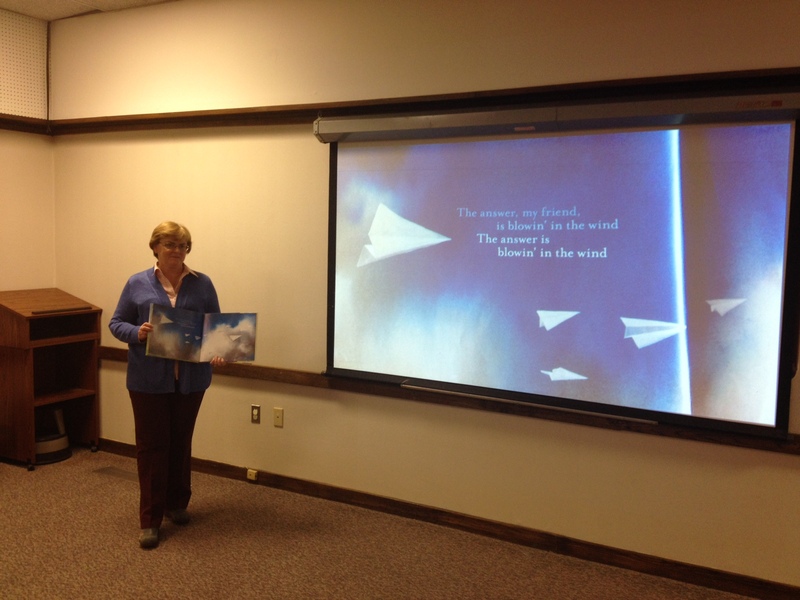 Recently, while planning a storytime about windy days, I came across a book, Blowin’ in the Wind, lyrics by Bob Dylan and illustrations by Jon J. Muth. It included a CD with the original recording of the song. The book contained the words from the song with beautiful illustrations. I was trying to figure out how to read this book, show the pictures, and listen to the CD all at the same time. But, I only have two hands. So, I turned it into a “movie,” a multimedia story. I used iMovie on the iPad. I uploaded the song into iTunes and took pictures of all of the pages of the book. I moved the song and the pictures into iMovie. Since I took the pictures in order, they loaded into iMovie in order (thankfully). I timed the pictures to match the words of the song, played around with the transitions between pictures, and there it was. It took me less than an hour to do this whole project. And, I had never used iMovie before so I was learning that as I went along. In the interest of full disclosure, I have used Windows Movie Maker. iMovie is easier to use. I heard one little child “whisper” to his Mom, “We’re watching a movie, Mommy!” Such a treat. Mary Dushel is a Library Associate and Early Learning Specialist at the Anne Arundel County Public Library in Maryland. She learned to love reading to children with her own children sitting on her lap. Now that they are in their 20s, she comes to work and reads to other children. It turns out that she loves that, too. Posted on April 28, 2014, in iPad, Story Time and tagged Mary Dushel. Bookmark the permalink. Leave a comment.